Since 2013, the Global Green Growth Institute has been working with the government of Indonesia promoting green growth. IPS correspondent Kanis Dursin interviewed Indonesia Deputy Country Representative Dagmar Zwebe about the country's steps in mitigating climate change. JAKARTA, Jul 25 2018 (IPS) - The South Asian nation of Indonesia is the world’s fifth-largest emitter of greenhouses gases (GHG) and is ranked as the world’s second-largest plastic polluter of oceans, just behind China. So when the country committed in the Paris Agreement to limit the rise in average global temperatures to below 2°C by unconditionally reducing its emissions by 29 percent with using its own finances and by 41 percent with international funding, many felt the goals too ambitious. The World Resources Institute (WRI), in a study on what is required for the country to reduce its emissions as promised in the Paris Agreement, noted that more ambitious actions would be necessary in order to meet the targets – referred to as nationally determined contributions or NDCs. “For Indonesia to achieve both its unconditional and conditional NDC targets, more-ambitious mitigation actions will be necessary. Our analysis suggests that the key areas of increased ambition should be strengthening and extending the forest moratorium policy, restoring degraded forest and peatland, and increasing energy conservation efforts,” WRI said. The Global Green Growth Institute, which has a mandate to support emerging and developing countries develop rigorous green growth economic development strategies, has been assisting this Asian nation draw up its national green growth roadmap. GGGI focuses on assisting countries in achieving quality economic growth through less stress on the environment and natural capital. “As the country aims to become a high-income country in the 2030s, continued rapid economic growth is required. Without adopting green growth approaches, Indonesia, already the world’s fifth-largest emitter of greenhouse gases and the largest contributor of forest-based emissions would only pollute the world more,” Indonesia deputy country representative Dagmar Zwebe told IPS. However, private sector involvement, strengthening of national policies and regulation on land use are required to bring the country closer to its targets. Q: GGGI helped Indonesia draw up its national Green Growth Programme. Tell us more about the roadmap and how you chose the priority sectors? The roadmap helps Indonesia chart a course toward a sustainable economy and focuses on energy, sustainable landscape, and infrastructure. These priority sectors were selected based on multi-stakeholder consultations, involving many government agencies and ministries, including advice provided by the Green Growth Programme Steering Committee. Q: Briefly, what green initiatives has GGGI introduced in each of the priority sectors? At the policy level, the national government and two provincial governments are now working to mainstream green growth in planning processes. For projects, GGGI designed a hybrid solar photovoltaic (PV) project combining an existing diesel-based power grid with solar PV in eight locations in East Nusa Tenggara. The facilities would reduce diesel consumption by 236 million litres or the equivalent to a total reduction of 549,300 tonnes of CO2 emissions and potential savings for state-owned electricity company Perusahaan Listrik Negara of around USD125 million over 20 years. In the forest and land-use sector, Central Kalimantan has now formed public-private partnerships for rewetting, replanting and revitalisation of peat landscapes, while in the infrastructure sector, GGGI helps develop bankable green infrastructure projects, especially in special economic zones. Q: Has there been any difficulty faced in implementing the programme? One of the difficulties faced is that often the general public, in all sectors, associate green developments with more work or more barriers, decreased returns, and slower developments. Q: What is needed to drive private investment in green initiatives? Just for example, the current administration has put infrastructure development as one of the country’s priorities. Based on the current plans, a total investment of USD400 billion is required in the transportation, energy, water and waste sectors over a five years period. While the government has allocated significant funding toward this goal, there is still a gap of USD150 billion to overcome. This is where the private sector can come in and play an important role. That has not happened yet for various reasons, including the national political and regulatory environment, lack of healthy pipeline of high quality, green and inclusive bankable projects, and capacity limitations in the public, private, and financial sector. Q: Under the Green Growth Programme, GGGI, in cooperation with government agencies, will train 30,000 civil servants on green growth. An important aspect of the Green Growth Programme is to build systems and capacity in ways that can be replicated. This is done through the establishment and operations of a web-based green growth knowledge platform hosted by the Indonesian ministry of national development planning, which will extend support to initiatives in other provinces beyond the two current pilot provinces of Central and East Kalimantan. The knowledge platform was launched in July, and will be further built upon over the next few years. GGGI is also working to strengthen capacity of stakeholders in the application of the extended cost benefit analysis tool, specifically in mainstreaming the tool into strategic environmental assessment methodologies, as part of the government of Indonesia’s development and spatial planning process. Q: In the first phase, GGGI worked with the Central and East Kalimantan provinces on several green programmes. How have the programmes developed? 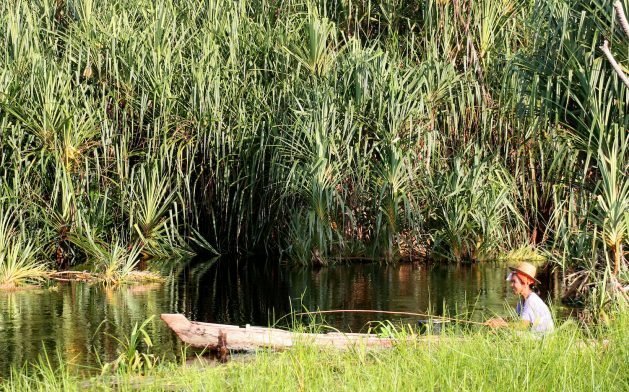 Districts Murung Raya and Pulang Pisau in Central Kalimantan allocated USD8.8 million in 2015 to implement their green growth strategies, covering six key sectors: forestry, mining, plantation, aquaculture, energy and cross-sectorial developments. GGGI has provided strong support for the development of the provincial general energy planning for East Kalimantan and Central Kalimantan. The plan followed the issuance of the General Plan for National Energy. Q: Do you think Indonesia can achieve its targeted reduction of GHG emissions? Indonesia has pledged to reduce emissions by 29 percent financed by its own resources and by 41 percent subject to international assistance by 2030. This is an ambitious target, but Indonesia is taking many steps to reach this. Even with all these efforts though, Indonesia is not yet on track to reach its targets. However, further strengthening of the earlier mentioned national policies and regulations in the land-use and energy sectors, including the moratorium on new forest and peatland concessions, peatland restoration, renewable energy mix targets, social forestry and degraded forest land rehabilitation, could bring Indonesia much closer to their target.